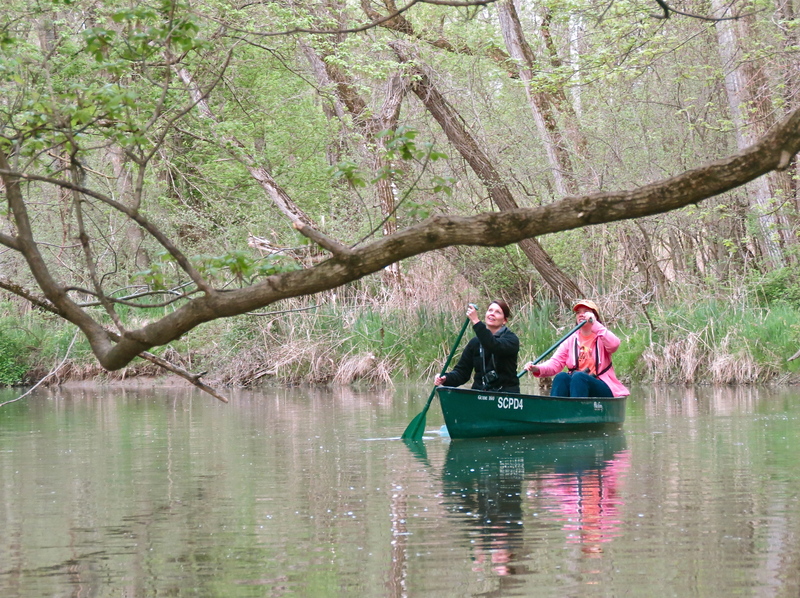 When I signed up to go to The Biggest Week in American Birding, the field excursion “Birding by Canoe” caught my eye. There aren’t many places to go canoeing in New Mexico, and in fact my one experience in a canoe had been at Disneyland when I was ten years old. 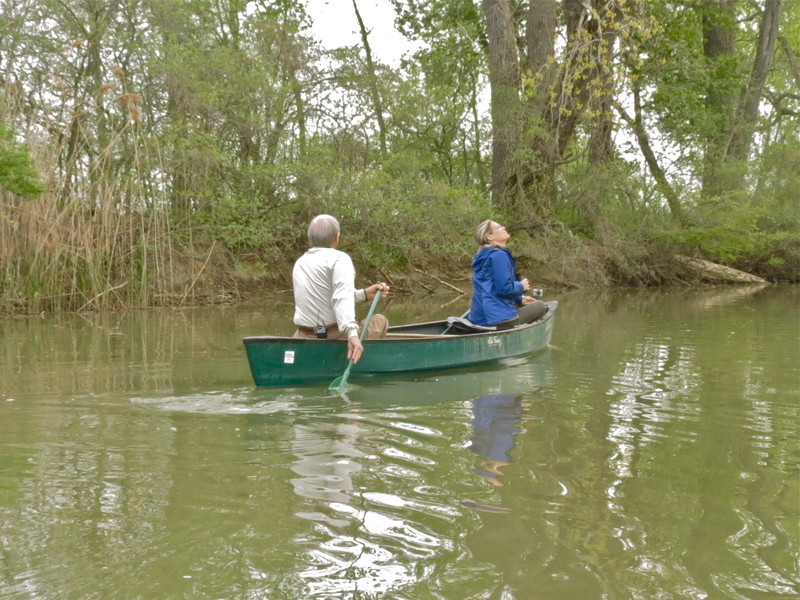 My excitement about a canoe trip was slightly tempered by apprehension when Kimberly Kaufman told me that CBS Sunday Morning would be filming during the trip. I had visions of my New Mexico derriere being filmed disappearing into the water. To be on the safe side, I left my DSLR at the cottage and took a point and shoot with me. We met at the designated place at 6:00 a.m. We stood around chatting and waiting for the film crew to arrive. It looked as if it would be a gorgeous morning. Biggest Week Birders await the canoe trip. 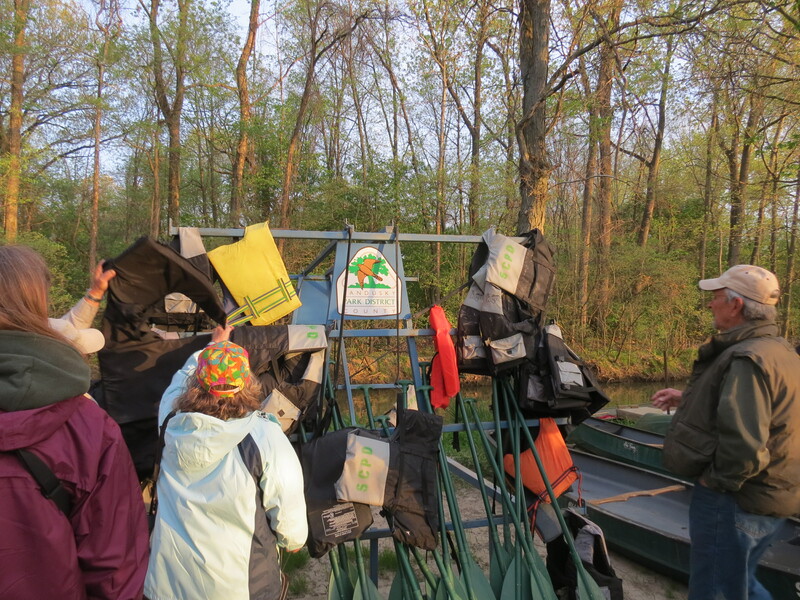 When we reached the canoe launch site, we were instructed to choose life jackets. We watched as the Sunday Morning crew made their preparations. The Sunday Morning film crew makes their preparations. The Sunday Morning crew set off down Green Creek, and Kimberly Kaufman spied something on the stream bank: an Eastern Phoebe. We paddled toward the bay in the calm waters. The film crew had a boat with a small motor. The rest of us provided our own power. 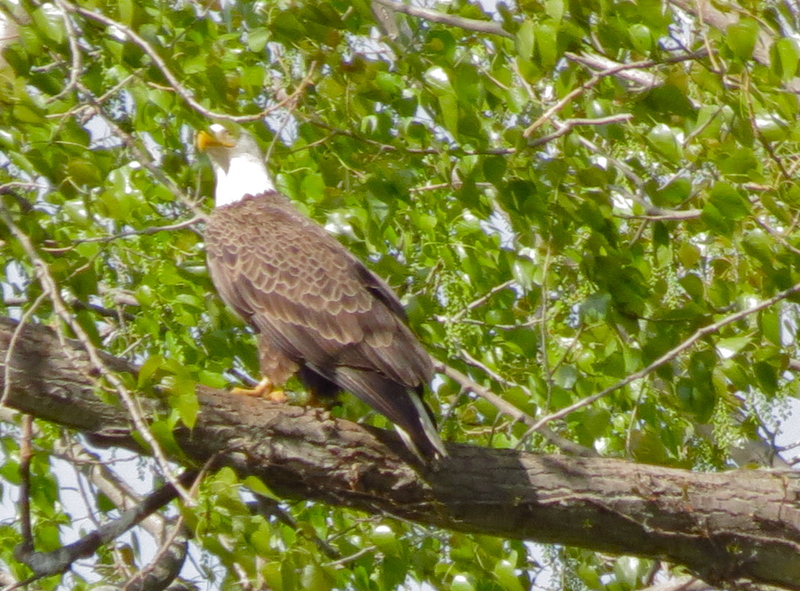 We saw Bald Eagles throughout the morning, and I discovered that it is very difficult to take photos from a moving canoe. 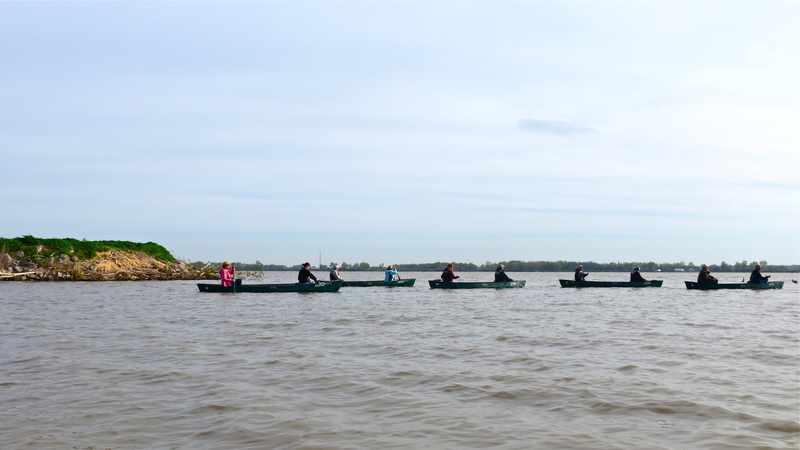 We paddled out into the bay and listened as Tom Kashmer told us about the history of the area. Kimberly Kaufman and CBS Sunday Morning Contributing Correspondent Serena Altschul were kind enough to allow me to take their photo. It was a delightful and interesting trip with wonderful people, as are all of the adventures at The Biggest Week. What a wonderful festival! 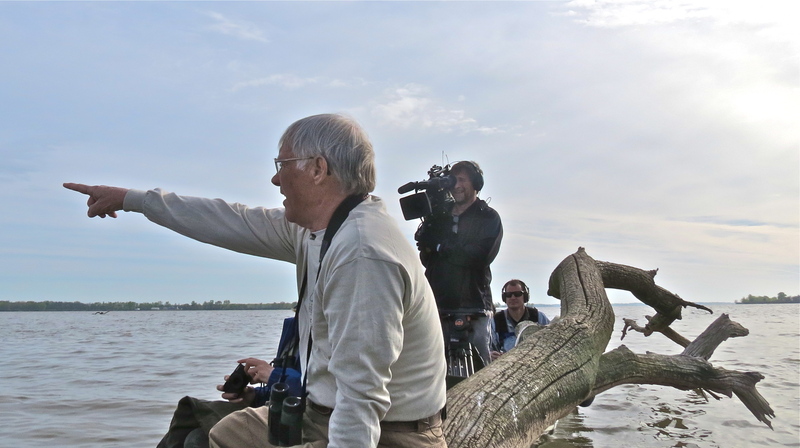 CBS Sunday Morning will air a story on birding on May 26, 2013. 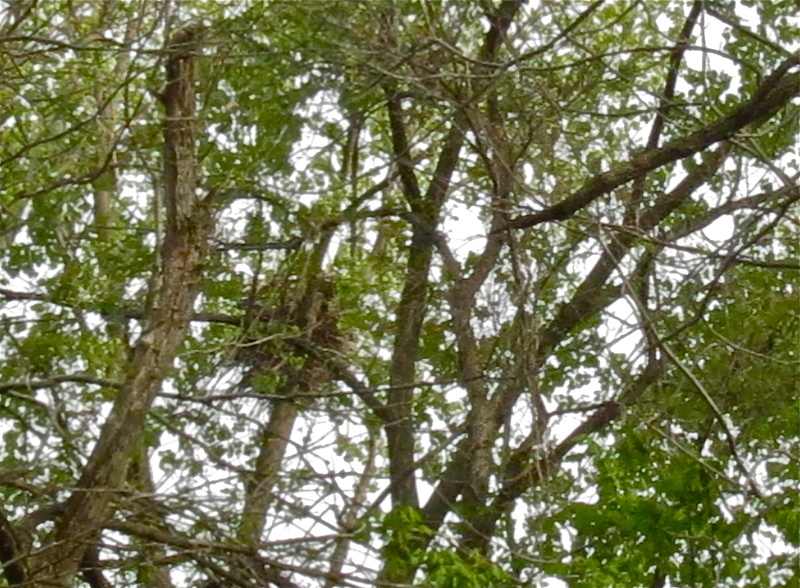 The Biggest Week in American Birding will be featured in that segment. Be sure to watch! Awesome adventure…love CBS Sunday Morning, when does it air? Camera & canoe..ha, ha..Kayaks are much safer..but no easier to take pictures from .. Great reporting.. ..never watch the Sunday shows..but I’d tune in for a chance to see your derriere..:D So glad you are enjoying life! Looks like it was a wonderful adventure! Wonderful pictures. Lovely post Linda – I must come to the Biggest Week next year! Thanks Nigella. And yes, you most definitely must attend the festival. 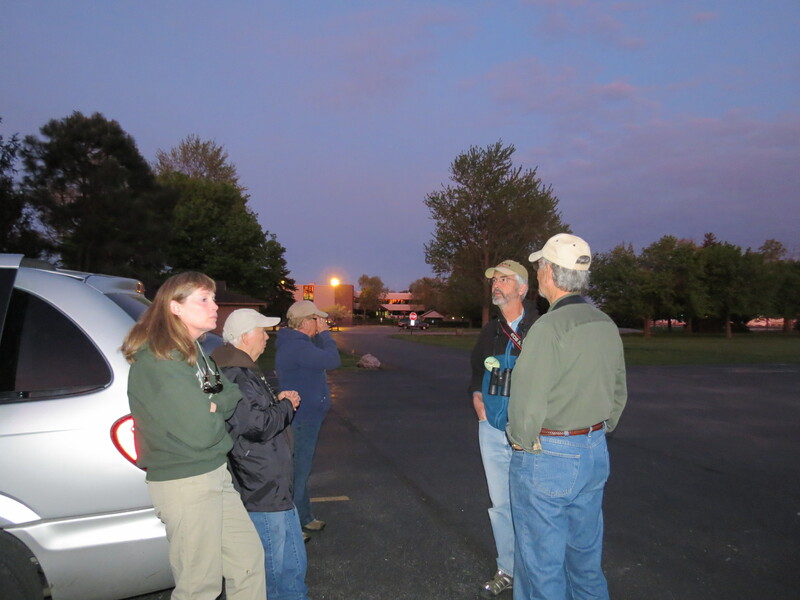 The Ohio birds and Ohio birders are wonderful! Your canoe trip looked like a lot of fun, I hope I’m able to attend the Biggest Week one year! You absolutely must attend. It’s a fantastic festival with beautiful birds. The Ohio birders are the BEST! I’d love to see you there!